Be 18 years of age or older(16 years with parent or guardian consent). Be able to swim at least 200m non stop without fins and at least 300m non stop with mask, fins, and snorkel. Have completed the AIDA Medical Form. Have completed the Liability Release form. This 8 hour pool freediving course is to introduce the complete beginner to freediving basic skills, knowledge and safety procedures. The course goes beyond snorkeling as you learn to safely and confidently freedive beyond 5 metres in depth. The course consists of two sessions. The first session is in the classroom focusing on knowledge development including learning how to breathe and equalise effectively for freediving. 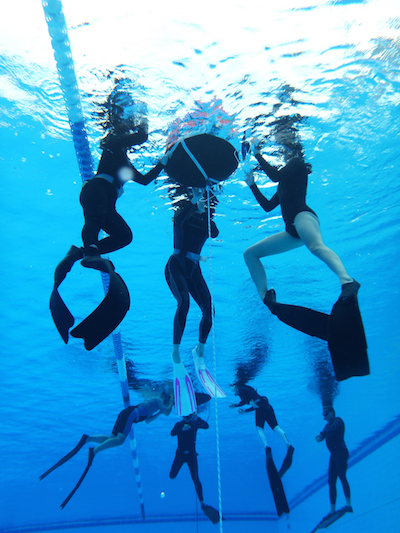 The second session is a pool or “confined water” session where these foundation skills are practiced. 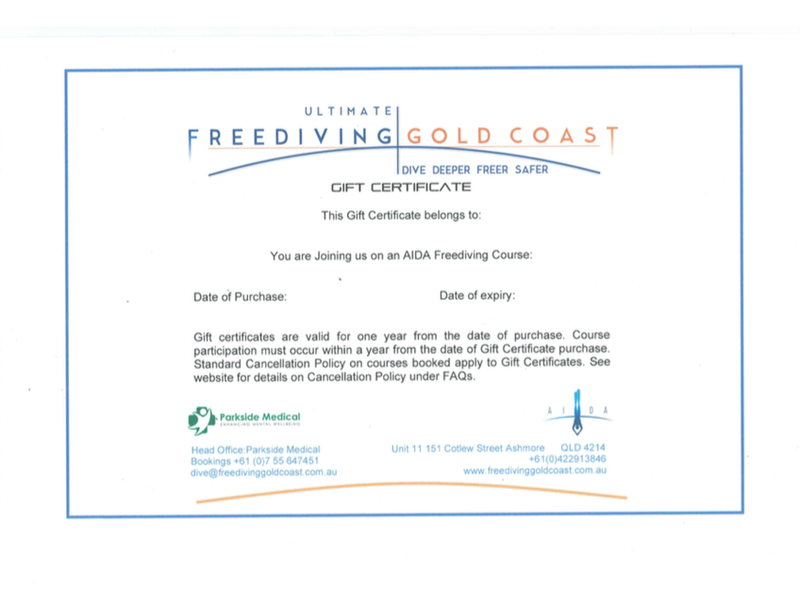 Freediving Gold Coast conducts the Intro Freediver course at a number of locations. When choosing the start dates of your course from the drop down menu please ensure you also choose the correct location. On the Gold Coast the Intro Freediver is conducted at two locations: Location 1 at Parkside Medical/Gold Coast Aquatic Centre or Location 2 at the Gold Coast Seaway. 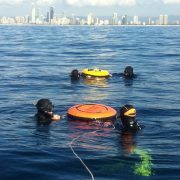 Please note that the Gold Coast Seaway Intro Freediver course is presently only conducted every Monday. For the weekend courses Freediving Gold Coast practices all the classroom activities at Parkside Medical and all the pool activities at the Gold Coast Aquatic Centre, arguably the best pool to practice freediving in the southern hemisphere. 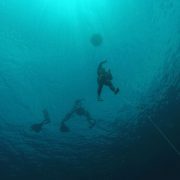 If you want to challenge yourself beyond the pool we recommend upgrading to the full Ocean Freediver course now for $300 (to Upgrade to the Ocean Freediver course from the Intro Freediver course at a later date is $330). On successful completion of this course the student is awarded the AIDA 2 Pool Freediver certification or AIDA 1 (depending on achievement level) and is registered on the AIDA website Education Online System (EOS). If you tick “Yes” to any medical conditions on the medical form you must see your General Practitioner prior to attending your course. Download Medical Form Here. Please complete the Medical Form and present to your Instructor at the beginning of your course. 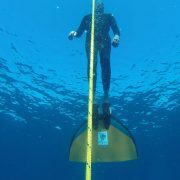 All specialised freediving rubber weight belts, weights and snorkels are complimentary during the course. For more information and description on wetsuit sizes please see FAQ.